My niece's birthday was last week and she turned 3. I sure do love birthdays!! It gives me an excuse to be extra crafty. 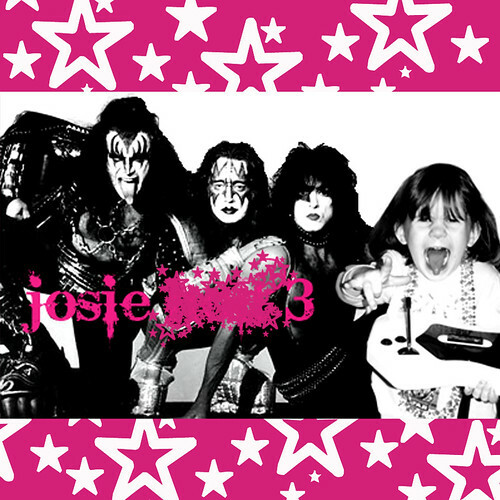 I was asked to help with the invitations for the Rock and Roll themed party. I changed the information on this one to protect the innocent. They handed out CDs and I helped to design the CD album cover. I sure do love photoshop too. 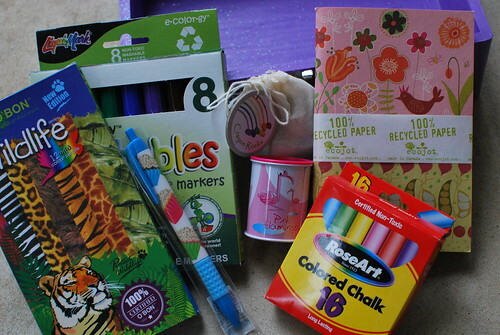 For her present I decided to make her an art box filled with eco-friendly art supplies. I bought an unfinished wooden box at Hobby Lobby. I painted the top with chalk paint and the bottom with purple. Then I used a glittery clear varnish for the top coat. 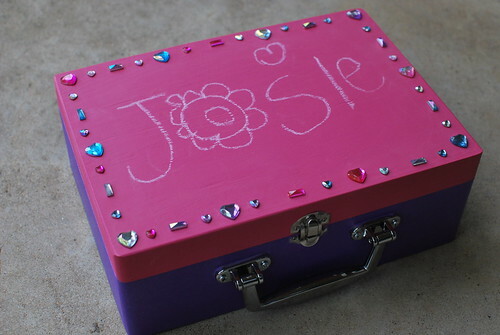 Harper helped me put the gems on top and wrote Josie's name. I thought it was cute. I also made her a crown because every birthday girl needs a crown, right? This birthday present is not for my niece. This one is for my best friend from college. Hopefully she is not reading this today because I am putting it in the mail to her today. I used the Lickety Split pattern from Made By Rae. It was really easy and came together as the name implies. I have material picked out to make myself one too. 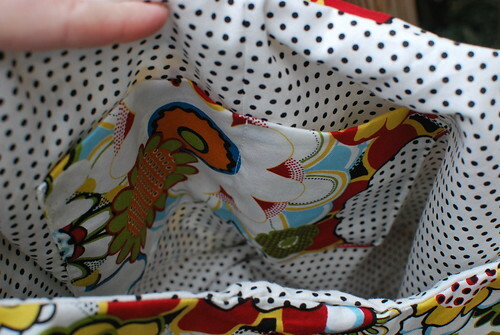 It's reversible, but I decided to put a smaller pocket inside for a cell phone, etc. instead of the larger pockets on the side. 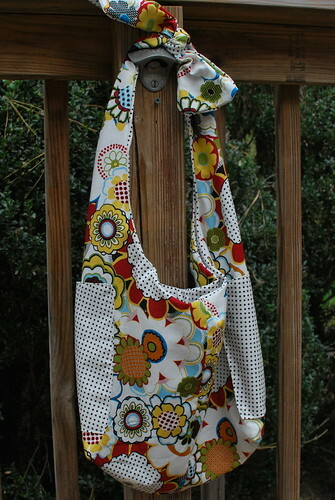 I didn't like the polka dot fabric as much and thought she probably will use the flower side more often. Love the invite and the album cover, and the box AND the crown. What a lucky little girl to have such a crafty aunty! Her tongue sticking out like KISS is perfect LOL! OH, she is one lucky girl to have an aunt like you! Harper did an awesome job on bejeweling the box, too! And LOVE the crown! Everything turned out so nice! I'm sure your niece was happy!!! Ok, so pardon the pun, but that Totally ROCKS!!! We may just have to use that idea for next year. 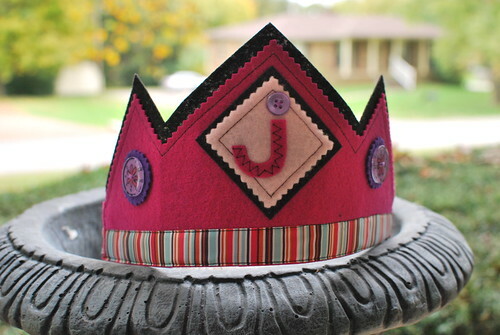 Great gift ideas too, and now I want a crown! so cute - ALL of that stuff! Your creativity nevr ends, does it? Love the idea of using chalkboard paint on the box. The invites are awesome! The CD cover is great. You should do a tutorial (hint, hint) on the birthday crown. Craft Queen! Love the crown, but the homemade gifts always melt my heart. 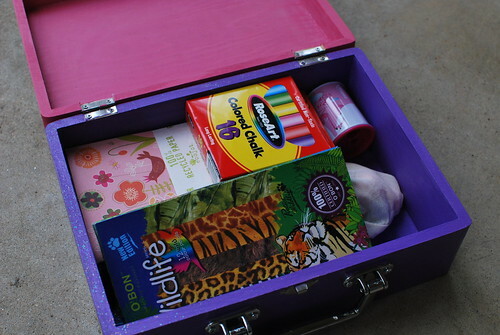 I bet she loved her craft box.